All but 1/2″ varieties are excellent for use in areas where drainage is an issue, because it is large in size it won’t tend to part away from where the water washes through. Looks best in landscape beds with large trees & plants accents the scale of the landscaping. 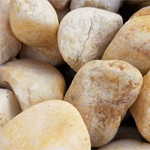 River rock are primarily used for stepping stones, waterfalls, and edging. They come in a variety of sizes and hues. 1 1/2″ river rock , in a light to medium brown color. It can be a nice compliment to your landscape. River rock can also be used for landscape decoration. 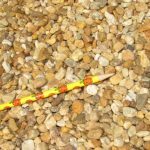 Most people prefer the look of this 1-1/2″ or 2″ rock. 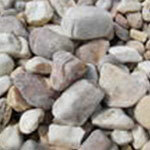 1 1/2″ river rock , most commonly used in landscape beds. The stones are a variation of colors meaning the brown is predominantly brown, but has some white in it and the white is predominately white, but has some brown in it. – 1/2″ river rock , in a light to medium brown color. Sometimes known as gravel or cobble, this natural river rock is used commonly as a ground cover or decorative as a dry riverbed. 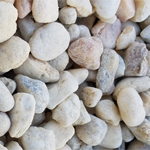 – 1/2″ river rock , also called pea gravel, most commonly used in gravel lawns, small walk ways and also used in general landscape beds. The stones are a variation of colors meaning the brown is predominantly brown, but has some white in it and the white is predominately white, but has some brown in it. 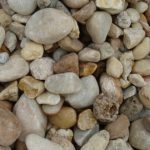 1 – 4″ river rock , most commonly used in commercial landscape beds. The stones are a variation of colors has some white, tan, and browns in it, but is prodomanatly tan in color. Large in size ranging from egg to soft ball size. 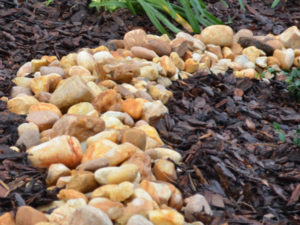 2 – 4″ river rock , most commonly used in commercial landscape beds. The stones are a variation of colors has some white, tan, and browns in it, but is prodomanatly tan in color. Large in size ranging from egg to soft ball size. 3/4″ river rock, in a light to medium brown color. These stones decorated streams and rivers for centuries until they transformed into the smooth, round pieces we have today. River rock is ideal for any decorative landscaping project. They retain moisture and are good for erosion control. River rock can also add beauty to your landscape. 3/4″ river rock, is our most popular size river rock. 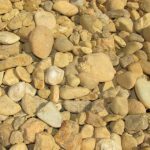 ¾” in size small smooth stones commonly used in landscaping available in white and brown. The stones are a variation of colors meaning the brown in predominately brown, but has some white in it and the white is predominately white, but has some brown in it.